It's only natural for pet owners to understand that sometimes dogs will be dogs — and that includes mischief and mayhem. But one daring pug has gone too far and landed herself behind bars. Cape May, New Jersey, police captured a rogue pug on Sunday afternoon and collared her for running away from home, according to a Cape May Police Department Facebook post. 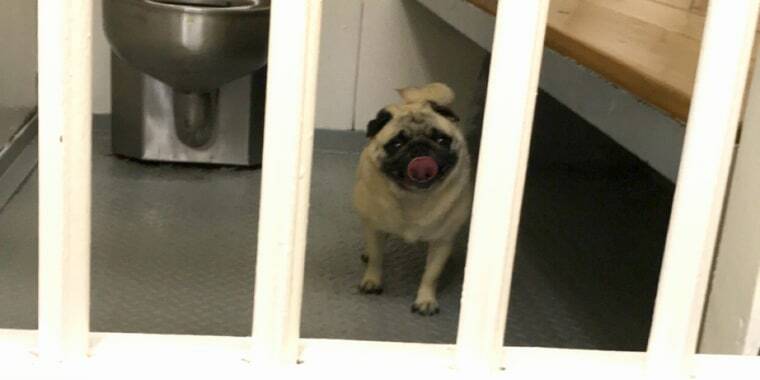 Bean the pug was caught prowling along the 1300 block of New Jersey Avenue, the police department said, so they had no choice but to bring her in for her "pug shot." Patrolman Michael LeSage, 25, responded to the call reporting Bean's trespass. According to LeSage, Bean was running around the caller's front yard when he arrived on the scene to take her into custody. Lost dog calls are pretty common, according to LeSage, and the dogs are usually excited to go for car rides with the officers. But this culprit required some extra care. "Bean ran over and put her two little legs up on the running board and looked at me like 'I can't get up here!' So I had to pick her up and put her inside," he told TODAY while laughing. "She stayed right next to me in the car and all the way to the station, at least 50 feet or so," said LeSage. "And then I thought, 'Why not give her a tour of the station?'" That's when the enterprising patrolman seized the opportunity for a fantastic pun and took Bean's viral "pug shot," along with some other jailhouse photos. After having their fun, the Cape May Police Department made efforts to locate Bean's owner via social media. The owners, later identified as the Hubbard family, came to retrieve Bean from the station that night after a neighbor alerted them to the CMPD's Facebook post. The grateful Hubbards brought cookies for LeSage the next day to thank him for helping Bean. "Thank you to CMPD from Bean the pug’s family for taking such good care of her," daughter Hadley Hubbard wrote in a Facebook post later that day. "She is sound asleep at home after an exciting afternoon on the run."